DDoS attacks are here to stay. They are getting bigger, more frequent, and more sophisticated in their quest to flood your network and disrupt service availability. 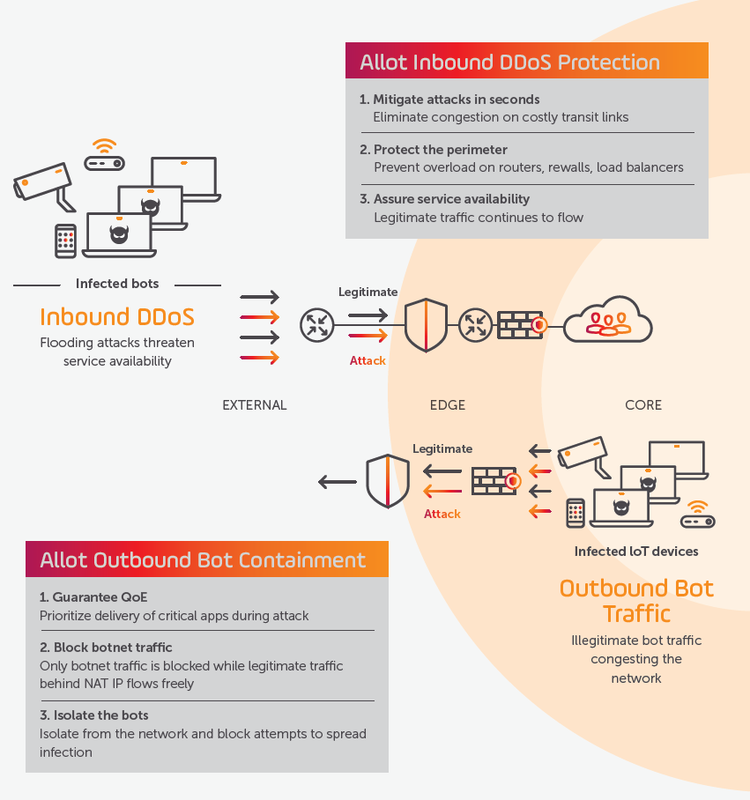 Allot DDoS Secure is your first line of defense against both inbound and outbound attacks. It surgically mitigates volumetric DDoS attacks and isolates infected hosts, before either can impact your service and business. Allot DDoS Secure brings several unique advantages to your business because it deploys highly scalable inline DDoS mitigation sensors that fully integrate with DPI functionality. Allot DDoS Secure inspects all traffic in and out to form accurate traffic behavior models and detect even the smallest attacks. Whether it’s DoS/DDoS, attacks originating from IoT connected devices, outbound spam, worms or port scanning traffic generated by bot-infected users, we’ve got you covered. Detect: We use multiple methods to detect anomalous traffic volumes and host behavior in your network. Filter: Using dynamic filtering rules, we surgically filter out attack packets and avoid over-blocking your network. This allows your legitimate traffic to flow unimpeded, keeping your business online and protected at all times. Pinpoint: By pinpointing the source of anomalous behavior, we can quickly isolate infected devices at their source, and prevent them from serving as vehicles for cyber-attacks. Real-time alerts: When a threat is detected and mitigated, we’ll notify you. Our detailed and customizable attack-mitigation logs, event analytics, host infection analytics, and trend/distribution reports will help to support your security planning, threat management and operational decisions. Africa National Broadband Carrier Secures DSL Infrastructure Against Cyber Attacks Without Installing New Equipment. Read More. Allot ERT helps prepare and protect a European election against anticipated DDoS attacks. Read More. Tier-1 APAC operator responds and defends itself against DDoS attack originating in the operator’s network. Read More. Add value to your IoT data plans with network-based security services that protect customers against ever-growing malware threats.